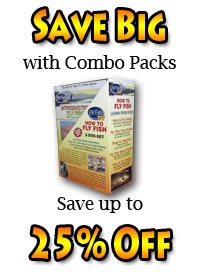 Midge Magic Fishing & Tying is a two DVD set that saves you over 30% off the individual titles. Discover the subtle skills for rigging and fishing midges, and learn to precisely tie eight versatile patterns. Midge Magic Fishing will help you refine the unique presentation techniques that small flies require. Davy Wotton demonstrates, on a variety of water types, all the skills needed to catch midging trout. He will take you through essential gear, teach you to assemble leaders and tippets, describe how to approach spooky fish, detail useful line management methods, explain casting tactics, and show how to get that critical “good drift”. See in detail how to build the long fine leaders that effective midge angling requires. Learn a variety of rigging systems and watch Davy fish them at different depths. This is a fishing lesson you won’t want to miss from one of the world’s top fly fishers. Wotton lives near the White River in Arkansas where he guides over 200 days a season. He is the creator of numerous unique fly patterns, and is exceptional fly fishing instructor. Midge Magic Tying demonstrates how to tie eight small patterns that can easily be adapted to match any midge hatch. Davy picks his top producers and precisely instructs you on the details he believes are essential for bringing such modest flies to life. Any stage of a midge or tiny aquatic insect’s life cycle can be simulated once you learn the ties; they fish well on both still and moving waters. Materials and Tools needed for tying such tiny patterns get a full chapter since Davy believes there is little room for error when it comes to midges. Several of these flies are Wotton originals which means they are made for fish and not to emulate some text book drawing. As usual his precise narrative includes techniques and tips you can apply to all your pattern crafting. Davy Wotton knows a lot about flies. For over 40 years he has tied, designed, and sold flies and fly tying materials. In addition he knows how to fish; spending over half his days on the water as a guide and instructor on the White River in Arkansas. Davy grew up in Wales in the British Isles where fly tying was born and he brings a depth of knowledge to the craft few others possess. I really like the Davy organized and broken down the lessons in the fly fishing video. The camera work really supported the information that Davy provided. I particularly Liked the helpful hints and tips that were provided by Davy in the fly tying video; simple but import tips and techniques to help you become a better fly tier. Thank you to Davy and his production staff. Great work. Davy Wotton Does it Again! This was just another great video for the collection with the concise information that Davy does present so well, reminding us of some past ways I had forgotten to the new updated versions. Another great video by Davy. He has lots of great tips on tactics, leader building and usage and of course a few good fly patterns. This video is very educational and reminded me of things I already knew. Both dish are worth watching and a good use of time. Davy will show you everything you will need to know to be successful in midge fishing. This DVD belongs in every flyfishers video library.